No one should be forced to drink contaminated water. No one should be deprived of water necessary for their agriculture and survival. And lastly, no one should need to walk in search of water. Yet this is exactly what countless Africans (including children) are obliged to do every day, often for hours, as there’s no access to water in their own villages. On April 14th, the four of us (Jessica, Lucia, Gil and Nicolas) will walk a distance of 100km (to be done within 32 hours) in solidarity with all our African neighbours, from Olot to Sant Feliu de Guixols. We will also be assisted by our wonderful support crew, Marta and Alessio. Each one of us must walk 100km (this is not a relay event). In order to be allowed to take part in this adventure, we must raise a minimum of EUR 1,500. So your help is needed! 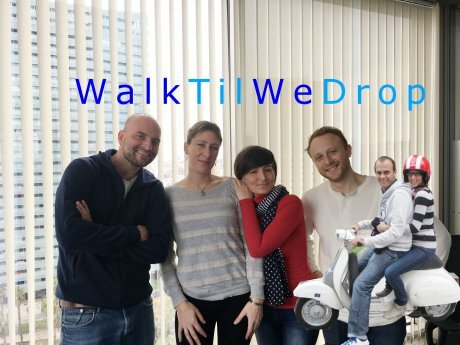 Many thanks in advance from the WalkTilYouDrop team! 19.04.2018 Paul Rayson 120,00€ Good luck!!! 10.04.2018 Anton V 20,00€ Good luck to all of you!! Great charity choice! 09.04.2018 Jonathan Pflieger 20,00€ Great initiative ! Good luck to you all.